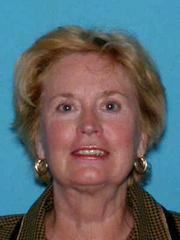 Lana Medinger, 65, white female, 5'1", 120 pounds, blonde hair, and blue eyes, was last seen on Monday, June 15, at 12:00 p.m. in Glassboro, N.J. She was on her way to a doctor's office in Washington Township, Gloucester County. Anyone with information that can assist in helping safely locate Lana Medinger is asked to contact the New Jersey State Police Missing Persons Unit at (609) 882-2000 ext. 2895 or Glassboro Police at (856) 881-1500.